Think about the most recognized duos of all time: Batman and Robin. Mario and Luigi. Buzz and Woody. Stability and Mobility. Wait, what? Yes, like superhero teams, stability and mobility work together to achieve a balanced, harmonious environment for functional movement. First, I want to bring to your attention a concept that has been around for some time; however, we often forget the important role it plays in day-to-day performance. Let’s reflect on anatomy and the structure of the human body. I challenge you to think of it in terms of one continuous structure in which each joint affects the joints above or below it. This concept is commonly referred to as the kinetic chain. It boils down to stable joints being stable when they should be and mobile joints being mobile when they’re meant to be. In terms of starting or stopping movement, stability and mobility are quite often complementary in nature. In case you missed it, let’s review the details from my preceding blog. Flexibility is primarily genetic, but can be improved slowly over time. It refers to the greatest length a muscle can achieve. This is often known as a joint’s range of motion (ROM). Mobility is the ability to synchronize one’s coordination and overall strength to move around a joint under load—as, for example, when doing the front squat. Now that we are adding stability to the equation, it enhances movement and helps it make sense. 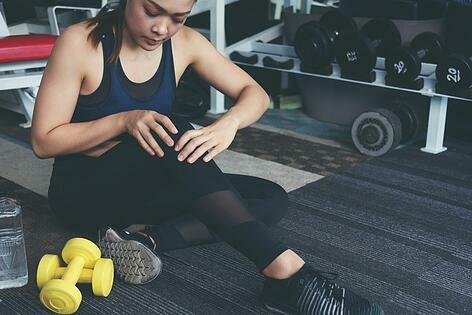 Stability is the ability to provide firmness and strength to certain joints, often with help from the surrounding connective tissue. The following illustration at www.acefitness.org depicts the six common links involved in the kinetic chain, along with their assigned level of stability. Each link or joint plays an important role in human movement and overall function. Therefore, a joint’s health and function are ultimately determined by its structure and the continuous tradeoff between being stable or mobile. When there is more of one, there is always less of the other. Why should you care? Well, when a joint is less stable, that means it is more mobile. More mobility means more motion at that joint; it can also mean more wear and tear, which can lead to more injury at that joint, including arthritis. Also, a less stable joint has to rely on surrounding muscle and tissue to provide the required stability, which can lead to injury in certain joints that are already highly susceptible. So the next logical question is, how do I train to improve stability? We’ll explore that question in my next blog.